It is important to me that my furniture is both beautiful and practical, and will give the owner pleasure for many years to come. So there are a number of steps that I go through to ensure this, before I even start to cut any wood. Initially it is important to see where the furniture will be positioned to ensure that I have the correct dimensions for the available space. As all of my pieces are bespoke, the dimensions can be whatever my customer wants, within reason. Most people have an idea of the type of wood they want their furniture to be made from, but not everyone does, so this is a subject which I like to discuss early on in the planning stage. 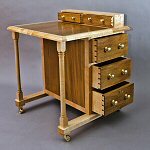 All of my pieces are made from hard wood, mostly solid wood, although I do use veneer when it is called for. It is also useful to know what the piece of furniture will be used for. I can then take this on board when making suggestions for the design. At this stage too I may ask about the type of finish required for the piece. For example, whether it is to be French polished or left with a more open grain. I also need to ask about any handles, hinges or other fittings that will be required. There is a huge variety of choice where these are concerned, so it is helpful to start thinking about them at an early stage in the planning. Once I have a good idea of what is required, I draw the furniture in detail. This will include diagrams of how the piece is to be made. I then return to the client to discuss as much of that detail as they wish. This may highlight a misunderstanding by me of their requirements, which requires a rethink. On the whole however it is more likely to lead to a few tweaks of the design to suit. In turn this could require more than one meeting to discuss the details. Once the drawings have been approved and my quotation for making the piece of furniture accepted, I will ask for a deposit to cover the approximate cost of the materials. I will also at that time give some idea of when the work will commence and roughly how long I anticipate it will take to complete. Please note these dates cannot be guaranteed. During the manufacture there may be aspects which take more or less time than anticipated. Throughout the process however I will be happy to provide progress reports,on a regular basis if required. Stage payments will be required as milestones are reached, to be agreed before the work starts.